Ventriculitis is the inflammation of the ventricles in the brain. 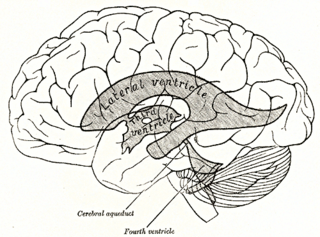 The ventricles are responsible for containing and circulating cerebrospinal fluid throughout the brain. Ventriculitis is caused by infection of the ventricles, leading to swelling and inflammation. This is especially prevalent in patients with external ventricular drains and intraventricular stents. Ventriculitis can cause a wide variety of short-term symptoms and long-term side effects ranging from headaches and dizziness to unconsciousness and death if not treated early. It is treated with some appropriate combination of antibiotics in order to rid the patient of the underlying infection. Much of the current research involving ventriculitis focuses specifically around defining the disease and what causes it. This will allow for much more advancement in the subject. There is also a lot of attention being paid to possible treatments and prevention methods to help make this disease even less prevalent and dangerous. Brain abscess is an abscess caused by inflammation and collection of infected material, coming from local or remote infectious sources, within the brain tissue. The infection may also be introduced through a skull fracture following a head trauma or surgical procedures. Brain abscess is usually associated with congenital heart disease in young children. It may occur at any age but is most frequent in the third decade of life. An exudate is a fluid emitted by an organism through pores or a wound, a process known as exuding or exudation. Exudate is derived from exude, "to ooze," from the Latin exsūdāre, "to sweat". A boil, also called a furuncle, is a deep folliculitis, infection of the hair follicle. It is most commonly caused by infection by the bacterium Staphylococcus aureus, resulting in a painful swollen area on the skin caused by an accumulation of pus and dead tissue. Boils which are expanded are basically pus-filled nodules. Individual boils clustered together are called carbuncles. Most human infections are caused by coagulase-positive S. aureus strains, notable for the bacteria's ability to produce coagulase, an enzyme that can clot blood. Almost any organ system can be infected by S. aureus. Liquefactive necrosis is a type of necrosis which results in a transformation of the tissue into a liquid viscous mass. Often it is associated with focal bacterial or fungal infections, and can also manifest as one of the symptoms of an internal chemical burn. In liquefactive necrosis, the affected cell is completely digested by hydrolytic enzymes, resulting in a soft, circumscribed lesion consisting of pus and the fluid remains of necrotic tissue. Dead leukocytes will remain as a creamy yellow pus. After the removal of cell debris by white blood cells, a fluid filled space is left. It is generally associated with abscess formation and is commonly found in the central nervous system. Cefotaxime is an antibiotic used to treat a number of bacterial infections. Specifically it is used to treat joint infections, pelvic inflammatory disease, meningitis, pneumonia, urinary tract infections, sepsis, gonorrhea, and cellulitis. It is given either by injection into a vein or muscle. Cavernous sinus thrombosis (CST) is the formation of a blood clot within the cavernous sinus, a cavity at the base of the brain which drains deoxygenated blood from the brain back to the heart. This is a rare disorder and can be of two types–septic cavernous thrombosis and aseptic cavernous thrombosis. Most commonly the form is of septic cavernous sinus thrombosis. The cause is usually from a spreading infection in the nose, sinuses, ears, or teeth. Staphylococcus aureus and Streptococcus are often the associated bacteria. A dental abscess is a localized collection of pus associated with a tooth. The most common type of dental abscess is a periapical abscess, and the second most common is a periodontal abscess. In a periapical abscess, usually the origin is a bacterial infection that has accumulated in the soft, often dead, pulp of the tooth. This can be caused by tooth decay, broken teeth or extensive periodontal disease. A failed root canal treatment may also create a similar abscess. Cerebral shunts are commonly used to treat hydrocephalus, the swelling of the brain due to excess buildup of cerebrospinal fluid (CSF). If left unchecked, the cerebrospinal fluid can build up leading to an increase in intracranial pressure (ICP) which can lead to intracranial hematoma, cerebral edema, crushed brain tissue or herniation. The cerebral shunt can be used to alleviate or prevent these problems in patients who suffer from hydrocephalus or other related diseases. 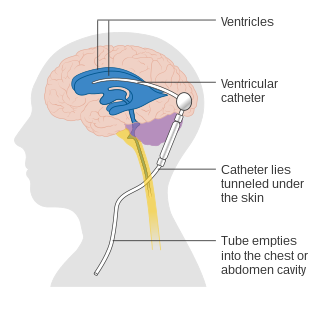 Shunts can come in a variety of forms but most of them consist of a valve housing connected to a catheter, the end of which is usually placed in the peritoneal cavity. The main differences between shunts are usually in the materials used to construct them, the types of valve used, and whether the valve is programmable or not. Neonatal sepsis is a type of neonatal infection and specifically refers to the presence in a newborn baby of a bacterial blood stream infection (BSI) in the setting of fever. Older textbooks may refer to neonatal sepsis as "sepsis neonatorum". Criteria with regards to hemodynamic compromise or respiratory failure are not useful clinically because these symptoms often do not arise in neonates until death is imminent and unpreventable. Neonatal sepsis is divided into two categories: early-onset sepsis (EOS) and late-onset sepsis (LOS). EOS refers to sepsis presenting in the first 7 days of life, with LOS referring to presentation of sepsis after 7 days. Neonatal sepsis is the single most common cause of neonatal death in hospital as well as community in developing country. Neonatal meningitis is a serious medical condition in infants. Meningitis is an inflammation of the meninges and is more common in the neonatal period than any other time in life and is an important cause of morbidity and mortality globally. Mortality is roughly half in developing countries and ranges from 8%-12.5% in developed countries. Neonatal infections are infections of the neonate (newborn) acquired during prenatal development or in the first four weeks of life. Neonatal infections may be contracted by mother to child transmission, in the birth canal during childbirth, or contracted after birth. Some neonatal infections are apparent soon after delivery, while others may develop in the postnatal period. Some neonatal infections such as HIV, hepatitis B, and malaria do not become apparent until much later. ↑ "Citrobacter". www.bacterio.net. Retrieved 1 March 2019. ↑ Ong CL, Beatson SA, Totsika M, Forestier C, McEwan AG, Schembri MA (2010). "Molecular analysis of type 3 fimbrial genes from Escherichia coli, Klebsiella and Citrobacter species". BMC Microbiol. 10: 183. doi:10.1186/1471-2180-10-183. PMC 2900259 . PMID 20576143. ↑ Greenwood, David; Slack, Richard C. B.; Peutherer, John F.; Barer, Michael R. (2007). Medical Microbiology: A Guide to Microbial Infections: Pathogenesis, Immunity, Laboratory Diagnosis and Control (17th ed.). Elsevier. pp. 1264–6. ISBN 978-0-7020-4009-2. 1 2 3 4 5 6 7 8 9 10 11 12 Babyn, Paul S. (2011). "Section I: Neuroradiology: Case 3". Teaching Atlas of Pediatric Imaging. Thieme. pp. 44–7. ISBN 978-1-60406-494-0. 1 2 3 Doran TI (1999). "The role of Citrobacter in clinical disease of children: review". Clin. Infect. Dis. 28 (2): 384–94. doi:10.1086/515106. PMID 10064257. 1 2 Feferbaum R, Diniz EM, Valente M, Giolo CR, Vieira RA, Galvani AL, Ceccon ME, Araujo MC, Krebs VL, Vaz FA (2000). 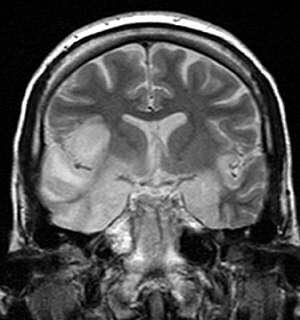 "Brain abscess by Citrobacter diversus in infancy: case report". Arq Neuropsiquiatr. 58 (3A): 736–40. doi:10.1590/s0004-282x2000000400023. PMID 10973119. ↑ McPherson C, Gal P, Ransom JL (2008). "Treatment of Citrobacter koseri infection with ciprofloxacin and cefotaxime in a preterm infant". Ann Pharmacother. 42 (7): 1134–8. doi:10.1345/aph.1L008. PMID 18577764.